CPIC assigns CPIC levels to gene/drug pairs. 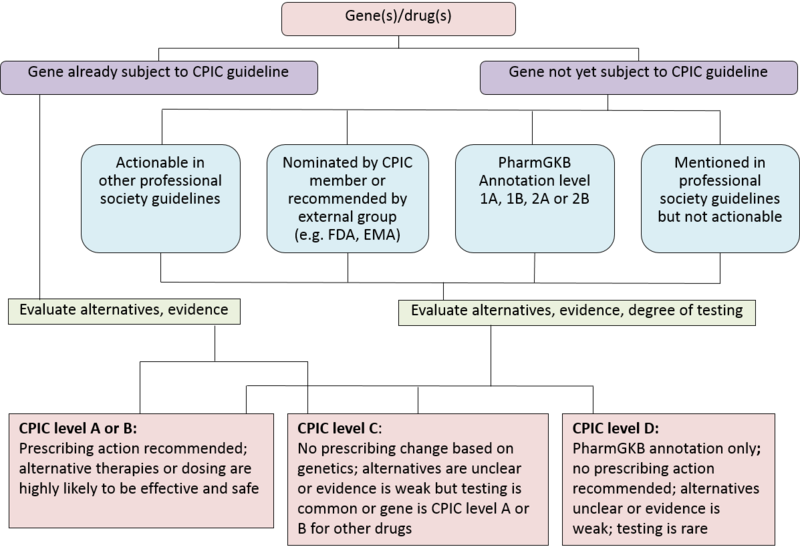 The levels (A, B, C, and D) assigned are subject to change; only those gene/drug pairs that have been the subject of guidelines have had sufficient in-depth review of evidence to provide definitive CPIC level assignments. A Genetic information should be used to change prescribing of affected drug Preponderance of evidence is high or moderate in favor of changing prescribing At least one moderate or strong action (change in prescribing) recommended. B Genetic information could be used to change prescribing of the affected drug because alternative therapies/dosing are extremely likely to be as effective and as safe as non-genetically based dosing Preponderance of evidence is weak with little conflicting data At least one optional action (change in prescribing) is recommended. C There are published studies at varying levels of evidence, some with mechanistic rationale, but no prescribing actions are recommended because (a) dosing based on genetics makes no convincing difference or (b) alternatives are unclear, possibly less effective, more toxic, or otherwise impractical or (c) few published studies or mostly weak evidence and clinical actions are unclear. Most important for genes that are subject of other CPIC guidelines or genes that are commonly included in clinical or DTC tests. Evidence levels can vary No prescribing actions are recommended. D There are few published studies, clinical actions are unclear, little mechanistic basis, mostly weak evidence, or substantial conflicting data. If the genes are not widely tested for clinically, evaluations are not needed. Evidence levels can vary No prescribing actions are recommended. PharmGKB curators create Clinical Annotations for gene-drug response pairs that summarize manually curated literature in PharmGKB.Each Clinical Annotation is assigned a Level of Evidence based on multiple criteria including replication, statistical significance and study size. Details of PharmGKB Level of Evidence can be found on PharmGKB. The FDA maintains a list of drug labels with pharmacogenomic information in their labeling: Table of Pharmacogenomic Biomarkers in Drug Labeling.PharmGKB annotates these drug labels with information about the strength of the language on the label and whether genetic testing is required, recommended or not discussed. Details of the FDA label testing descriptions can be found on PharmGKB.